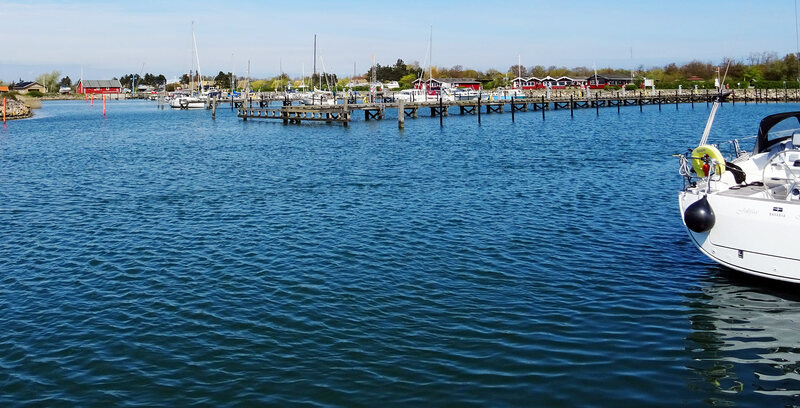 Now hold on to the rails and grab tightly – this is definitely one of the most beautiful marinas I have ever visited so far: Gedser in Denmark at the southernmost tip of our beloved neighbor. When we reached this pearl of the Baltic Sea during my first ever sailing trip as skipper of the boat (read the article here) the whole crew of SY XENIA was stunned by the intimacy and beauty of this spot. I can barely find words. First of all, Denmark is and will always be the perfect destination for spending your holidays in a perfect manner. No matter if you are seeking the quietness of virtually untouched nature in the north of Jutland, if you seek the rough hard seas of the North Sea and endless sand dunes with your dream holiday-house or marvels of marinas, well maintained and serviced with the Danish hospitality: Denmark has never ever disappointed me in any way. Gedser is a very, very small community of no more than 3.000 people living in a village. The one and only thing that seems to keep this spot alive is the ferry connection to Warnemunde/Rostock and therefore provides for a constant flow of cars and trucks. The ferry port of course is restricted only to commercial shipping – which is a cool thing – because otherwise one would have to share the berth with those ugly loud and steaming huge hulks. Gedser yacht harbor is a very different story. 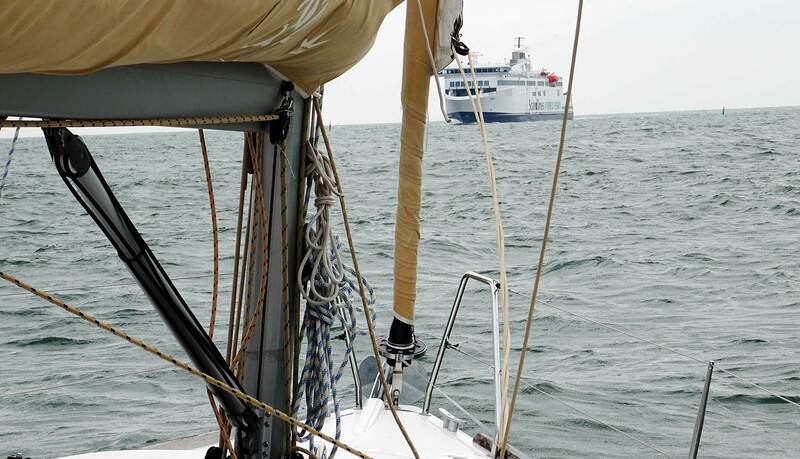 Upon reaching Gedser all along a buoyed fairway you will take a sharp turn to port side and follow another fairway – and you are advised to precisely follow it due to very, very shallow waters nearby. Going here is a bit tricky since there can be very strong currents and cape effects in more nasty sailing conditions which make it tricky to land and cast off here. I myself had to leave Gedser marina in a 5/6 Beaufort wind and had to go full throttle with the 30 hp-engine on the Dufour 382 in order to keep her inside the buoys. On the other hand: These circumstances may contribute to the fact that this harbor isn´t overrun in the high season although it would be clever to reserve a berth in advance or at least call the harbor-master. Mooring here is a pure treat, the whole marina is a little marvel. There are not many berths for guest boat available, I would estimate not more than 15 boats can be mooring here at the guests jetty alongside the harbor. There are 200 berths available all in all. After a recent storm the entrance had been silted up and the draft of your yacht should not exceed 2 meters, otherwise you are advised to go into the ferry/fishing boat harbor nearby. This is the jetty for guest boats. Be here early. Once landed you´ll find all amenities and facilities within a walking distance such as harbor office, a small restaurant, bathrooms and showers, a self-service filling station and the automated vending machine for paying the demurrage. 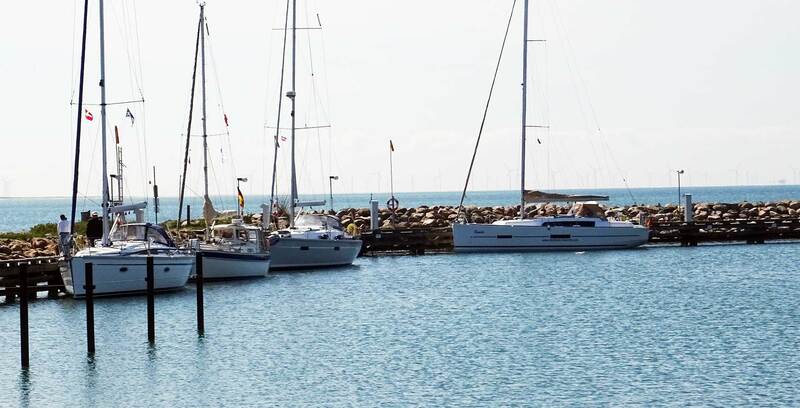 Gedser marina is small, very quiet and – as everything in Denmark – kept tidy and clean in a perfect condition. Sailors seeking a rest after a long or stressful sailing trip will find here plenty of peace and quietness. As with everything in Denmark prices aren´t that cheap at all. I was paying 20 Euro per night for the 36 feet boat. Prices go up the larger the boat. Paying will be done at the vending machine that will print out a colorful adhesive sticker to be put around the reeling. I haven´t seen somebody going around and checking on these stickers but a lot of friends assured me that cheating this system isn´t the smartest thing to do. 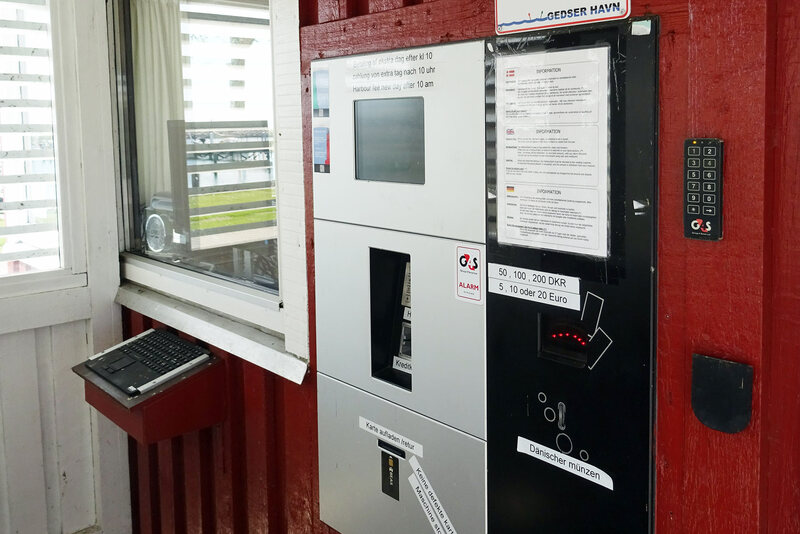 In the demurrage included is electricity and fresh water which can be drawn from the dispensers all along the jetties, which makes the high price acceptable as we all know that especially electricity is a very expensive commodity in Denmark too. I somehow missed the old fashioned harbor master but I can also imagine that sales of this small marina won´t be sufficient for a fully paid job in this matter here. There are large bathroom facilities with a lot of WCs and shower booths. This is not a matter of course in all marinas I have met – I still remember wonderful Island of Porto Santo in the Atlantic Ocean with double the berthing capacity than Gedser and with just one single toilet for the whole marina! 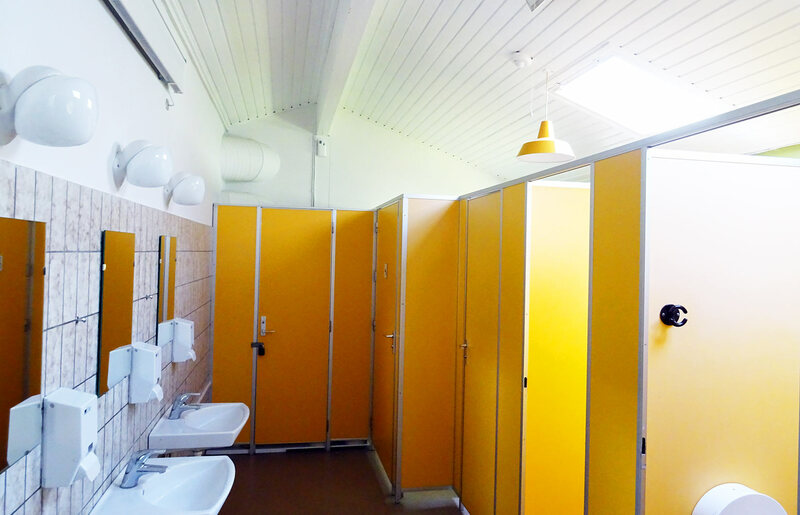 It´s a colorful Scandinavian styled bathroom – well kept and tidy. Taking a long hot shower of course is a different story: You´ll need to get a prepaid plastic card at the vending machine and fill it up with money. 4 minutes of hot water for a nice shower do come with a price tag attached: 1.40 Euros. So the average ordinary teenage girl will spend some 10 Euros for a “thorough” shower here, I found 4 minutes rather short because it takes you at least 2 minutes to figure out the right amount of (very!) hot and cold water to even start taking your shower! To be honest: Here isn´t much to talk about. There is a small restaurant offering a limited range of mostly fried convenient food – much better for having a Danish “Öl” in the evening though. On the marina compound is a large BBQ-space with a load of masoned grill stations. One just needs charcoal and meat. This of course can be bought in Gedser´s one and only super market which is some 15 minutes by walk into the small village. All in all, there isn´t much here, but that is also the reason for the unique quietness and peace that this place is radiating. I loved my stay here. The harbor is well kept, inviting, kind of intimate and thus very quiet and peaceful. 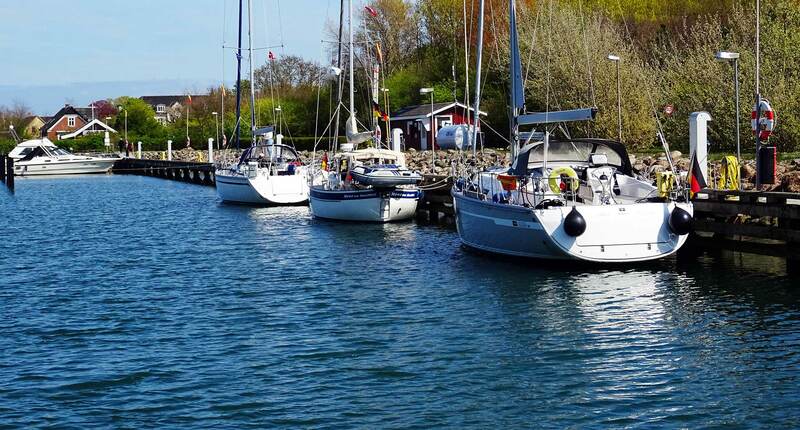 If one seeks action and a lot of cool stuff to see, Gedser is definitely not the right destination for a sailing trip – if you are looking for resting your oars, you are about to find a small paradise here.